3-Piece Red Dragon Sword Set | BUDK.com - Knives & Swords At The Lowest Prices! The dragon has symbolized both power and prestige for over 4,000 years in Japan. This classic weapon set is no different. Each blade is stainless steel construction with a heat-tempered finish. The uniquely shaped handles are each meticulously wrapped in red cording and accented with gold colored tsuba. This set includes a red lacquered sheath for each item and a table top stand to display the entire set. 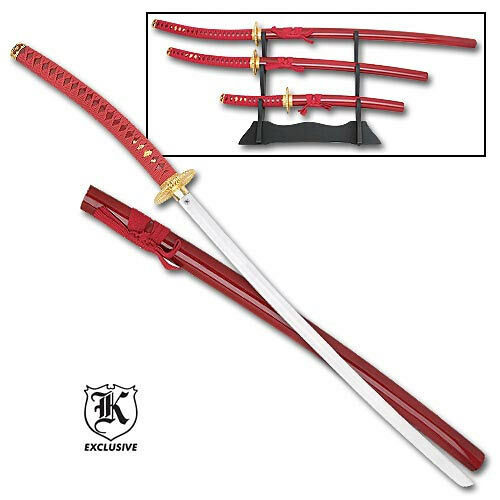 Measurement for each piece in the set are: katana: 43 1/2" overall, 26 3/4" blade; wakisashi: 33 3/8" overall, 19 1/8" blade; and tanto: 22 7/8" overall, 11" blade.